Night vision scope is essential and useful tools for multiple groups of people: the military uses it to see in low light conditions, hunters can use it to hunt animals during the night and many more. In case that you need to hold target practice at night or if you hunt, best night vision scope is essential if you want to increase accuracy and locate a target without any additional problem. We decided to present you guide so that you can determine everything about best night vision scopes and that will lead you to make qualified and informed a purchase. We will cover high-end and low-end night vision scopes in various price ranges and with different technology, so that you can determine which one is the best for you. Looking for night vision goggles? we reviewed cheap night vision goggles recently, have a look. makes it lightweight and straightforward to carry around without fatigue. It runs on four AA batteries, and according to the manufacturer it is better to choose lithium batteries. Mounting is simple as possible because it contains Picatinny mount. It comprises 850mW infrared illuminator that you can attach to optic so that you can see black scenarios. As soon as you mount the weapon, you should install SD card and press the power button. It contains two-step system that will calculate the distance for you; that way you will be able to know the size of the target, range of the head and feet. This particular ballistic feature is excellent when it comes to best night vision scopes. In overall, X-Sight II night vision scope is the excellent way to extend your range for informal target shooting, hunting, and competition shooting. Of course, it is expensive when compared with other night vision scopes, but you will still be able to finish the job with fantastic accuracy, which is the main reason for its popularity. features SumLight technology that increases CCD array sensitivity. . The best thing that you can choose when it comes to night vision scopes is Pulsar DigiSight N550 night vision riflescope that uses digital NV picture, which is monochrome. The main reason for that is because it uses Charge Coupled Device to create a better image instead of the intensifier. When it comes to design, you will get polymer, blocky and numerous controls and buttons. The power comes from four x AA rechargeable batteries, and you will get the charger within a package. The maximum run time is two hours, so we recommend you to have a spare battery just in case. You can also add external power supply so that you can enjoy without too much hassle. The performance will provide you light grey and sharp picture with integral IR that will detect small animals at 100 yards. The maximum range is up to 350 even though manufacturers stated between 150 and 175 yards. You will get the possibility to enjoy the night especially when you have in mind three-year warranty that you will get the package. In overall, Pulsar DigiSight N550 night vision riflescope is an excellent solution if you want to choose high-end riflescope that will provide you the immersive amount of features and capabilities. It has outstanding features, but on the other hand, there are some disadvantages such as battery working hours. However, you will get high-performance night vision scope so that you can hunt during the night hours. X-Sight I night vision scope is an excellent solution if you want high-end night vision scope with a decent price tag. Within a package, you will get illuminator, micro SD card, sun shield, lens cover, quick start guide and batteries in a handy bag. X-Sight I night vision scope is an excellent digital camcorder that contains the possibility to work as night vision scope. It is a unique way to enjoy in a high-tech solution that can easily synchronize with iOS and Android apps such as live viewfinder. You will get 850mW IR illuminator that has adjustable brightness and fox as well as elevation adjustment and windage. You can easily mount it, and you will get 2.6-inches eye relief. It is the functional position, and the height is just incredible when compared with other riflescopes. It works on four x AA batteries, and IR illuminator uses two CR123 As. It includes reticle focus that you can adjust for your eyesight as well as image focus, which is similar to manual cameras. In overall, we can say that X-Sight I night vision scope has excellent night vision features and capabilities with the help of IR illuminator. Performance is decent, and you will get the possibility to mount it as simple as possible. Of course, battery life is not that efficient and digital zoom gets fuzzy when it reaches maximum range, but you will still be able to make HD video recordings and enjoy in GPS and other high-tech features. Sightmark SM18008 night vision scope is a great choice if you want higher magnification than the previous version as well as 33% more battery life and 30% less weight. It includes the possibility to magnify up to 4.6x. It has a 42mm objective lens that works with 640×480 resolution. You will get the possibility to catch details up to 120 yards, which are decent performance when compared with other night vision scopes on the market. You can capture everything during both night and day as well as video recording as the main accessory to the weaver rail. You will also get digital elevation and windage adjustment, which is an excellent solution if you want to acquire better precision within a streamlined design. In overall, Sightmark SM18008 night vision scopes is an excellent choice if you want to have versatile and best night vision scope for night hunting. It has a lot of features as well as waterproof capability so that you can hunt in rainy and humid areas. The main disadvantage is that it doesn’t have GPS features that will provide you additional convenience. Apart from that, you will get decent night vision scope that will stay in your hunting accessories for ages. The first thing that we want to mention is that Firefield FF26014T night vision scope comes from titanium alloy housing. That way you don’t have to worry about damaging it. At the same time, it has internal focusing feature and possibility to use it with additional comfort because of ergonomic design. This particular night vision scope has built-in infrared illuminator that will help you increase range in low light conditions and enhance the image brightness. It uses 2.5 x 50 enhanced options as well as a sleek design that will make it unique when compared with other night vision scopes. It includes internal focusing ability for additional comfort while shooting. It comprises 50mm lens for higher resolution and flip-up lens covers that will reveal illuminated reticle and multi-coated options. You can quickly increase range in darkness and increase brightness in dark surroundings. Of course, it could be a slightly better when it comes to maximum range and array of features, but you will still get best night vision scope. Trijicon TR24 night vision scope is one of the most popular and best riflescopes on the market. We decided to present you because it is an excellent solution for your hunting moments. The first thing that we want to mention is that you will get superior quality lenses. You will get multi-coated lenses for extra quality. At the same time, these lenses have light gathering capabilities so that you can enjoy in clear images even when it’s low light outside. It works with fiber optic technology that will automatically adjust the brightness and contrast. Thanks to this new technology, you will get better image clarity than any other riflescope on the market. It doesn’t work on batteries, so you don’t have to worry about the hassle of changing and charging batteries. When it comes to design, you will get aircraft-grade aluminum housing, which is great because it can withstand any weather condition. This will keep it from corrosion and rust because of harsh weather elements. In overall, Trijicon TR24 night vision scope is an excellent solution if you want the combination of the attractive price tag and high-end features. It is one of the most popular night vision scopes for hunters because of fantastic lens quality and outstanding image features. However, most users stated that customer support is not that efficient and that you should follow private guides and reviews to determine how it works, especially if you are a beginner. The Thor HD 640 smart thermal riflescope is an excellent solution if you want a terrific gyroscopic model that works steady and with a higher power. You can quickly capture 1280 x 960 still images or videos and save them directly on Micro SD card that you will get a package. It also contains micro HDMI output that will allow you to display videos or photos to TV or computer for storage or playback. It has built-in Wi-Fi possibility, which is an excellent solution for sharing media. You can record it to RAV. It is simple to use, and you will be able to range the target through Smart Rangefinder. It will automatically adjust the point of impact as soon as you make the appropriate range. It is compatible with the Obsidian app so that you can stream the view, save images, and post them on social media. It also includes GPS antenna so that you can geotagging videos and photos and see a map where you took the image. In overall, Thor HD 640 smart thermal riflescope is one of the best night vision scopes available on the market. It includes a lot of high-end features that will help you hunt during the nighttime. The most convenient features are a possibility to connect to Wi-Fi or through Bluetooth so that you can share images further without any additional problem. Of course, for this kind of technology, you have to spare a small fortune, but the investment will pay itself off in time. Flir ThermoSight R-Series RS64 night vision scope is an excellent solution if you enjoy hunting during the nighttime. It includes matte-black finish with rugged units. Because of the sturdy exterior, it can easily withstand heavy outdoor use. It includes Active Matrix LCD with 640 x 480-display resolution for high-level clarity. You will be able to see e-zoom level and battery charge on display. It comes with Li-Ion battery that will provide you 4 hours of constant use. You can recharge the battery by using USB interface or wall charger. When it comes to lenses, you will get a focal length of 60mm, which is suitable for focused images. You can adjust it to three different styles: German, Duplex and Fine Duplex. You can also choose four reticle colors such as Black, White, Green, and Red. In overall, Flir ThermoSight R-Series RS64 night vision scope is an excellent choice if you want the high-end night vision scope with amazing features. Of course, the primary concern is expensive price ranges, but you will also get impressive specifications and features. If you want to choose night vision scope that will provide you thermal perspective and clear images, we recommend you to choose this particular one. If you want to choose best night vision scope with great features, we recommend you to choose Armasight Nemesis night vision scope. The best thing about it is that you will get 6-x magnification, which will allow you to see very well in sharpest focus possible. At the same time, it includes Generation 2+ night vision technology, which is much better than the previous version. You will get brighter and brighter images, better resolution, longer life expectancy, more extended range, more versatility and larger field of view. The scope contains internal elevation and windage adjustment so that you can position the range in perfect and desired angle with minimal problematic. This is very useful if you want to ensure that you positioning is accurate. Another essential feature that you should have in mind is detachable IR illuminator that will allow you to see faraway objects during the night. As the light reduces, the IR illuminator will start to emit infrared rays on your target, and as soon as it reaches it, it will become extremely bright. In overall, Armasight Nemesis night vision scope is one of the best riflescopes that you can find on the market. It contains impressive features such as renowned Generation 2+ night vision and illuminated reticle among others. Everything combined makes excellent scopes for hunting during both the night and day. The combined features will provide accuracy at long distance and perfect sight at night. If you want to improve your accuracy, we recommend you to choose this particular night vision scope. High 3x magnification. Lens focus(mm):70, Field of view(º): 14, Eye relief(mm): 45, Diopter adjustment(dptr. ): ±4. Firefield FF16001 night vision scope will provide you fantastic combination of sharpness and clarity, which makes it the perfect solution for nighttime hunting. You will get 3-x magnification, which is excellent when compared with other night vision scopes. That will allow you to bring targets into sharp focus. At the same time, combined effects will let you hit long-range objects with fantastic precision. It contains user-friendly controls that are very useful when you want to shoot a distant target. It also includes efficient IR illuminator that will enhance the image resolution and provide you the possibility to enjoy all the way. When it comes to design, the body includes materials that will protect it from hard impacts and mechanical shocks. The night vision scope comprises solid titanium body, which makes it indestructible. It is perfect if you want to hunt through unfamiliar terrain. In overall, Firefield FF16001 night vision scope is perfect for hunting in the darkness because of its unique strengths. It is much better than other more expensive night vision scopes when it comes to clarity and magnification. At the same time, IR light mechanism works correctly, and it will allow you to make precise shots in the dark and over long yards. It includes ergonomic features and durable design so that you can use it for decades without any additional problem. You should have in mind that night vision scopes look similar to regular ranges. However, they have the additional advantage that will allow you to hunt during the dark. 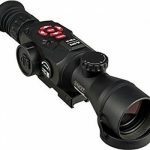 Magnification – The first and most important factor when it comes to night vision scopes is the magnification The better magnification, the more vast scope will be. Magnification levels between 3x and 5x are more budget-friendlier options for shooters, while it can reach up to 10x for pricey models. Weight and Size – You should have in mind that night vision scopes are much more substantial than conventional As the magnification increases the size and weight increase too. The main problem that could happen is that rifle will be more massive if you carry rifle for a long time. Therefore, you should consider lighter optics so that you can use it for an extended amount of time. We have presented you a thorough review and buying a guide to best night vision scopes in [year]. When choosing the best night vision scope, you should have in mind all features and factors that could make you a better shooter. Of course, everything depends on your preferences and whether you want to use it for occasional or frequent hunting. If you have anything to add, we recommend you to comment in the section below, and we will answer you on short notice. Checkout more best Night Vision Scope using below best sellers link.